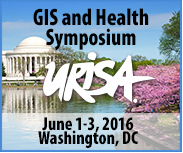 The Urban and Regional Information Systems Association (URISA), in partnership with the American Public Health Association (APHA), invites abstract submissions for the 2016 GIS and Health Symposium. The theme for this year's Symposium is “Mapping the Way to Healthy Communities”. The event will take place June 1-3, 2016 in Washington, DC. Abstract submissions are due on March 15, 2016. The Symposium program will be developed, in large part, from abstracts submitted by the community through this Call. The Committee welcomes the submission of individual papers, complete sessions, and panel discussions on a variety of topics. We are specifically interested in abstracts related to the following topics. Tools for policy-makers, planners, researchers. Creating synergy between the public health realm and urban and regional entities carrying out planning, research and policy.